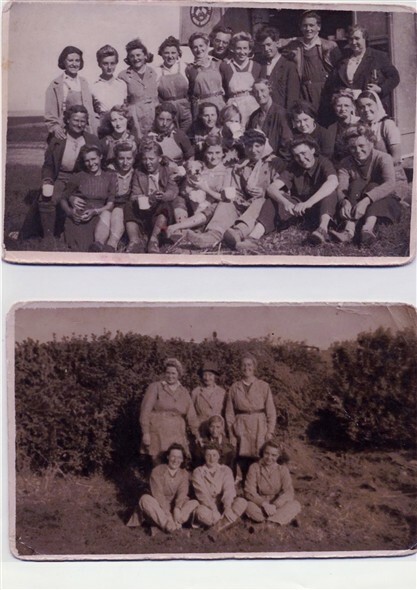 The large group photograph shows members of the Womens Land Army during the last war having a break. My mother, Kathleen 'Kath' Smith is third from the right, bottom row. I know she was living at Saltdean at this time and the photograph was taken in the Peacehaven area. I do not know any members of the smaller group. All I know is one is my eldest sisters God other. She was christened in Chertsey, Surrey, in 1947/8 - Yvonne Angela Chapman. If anyone has any details or is in the group I would be interested to know any information about them. This page was added on 04/06/2008. Would it be possible to post bigger photos somewhere? My Mother's youngest sister may be in one of them because she was in the Land Army while living in Whitehawk Crescent but I may not recognise her even in a clearer photo. My Mother had left Brighton for London by then and was a Fire Watcher.